Lexus’s big-seller gets a nip-tuck and new safety kit for 2018. By Craig Thomas. 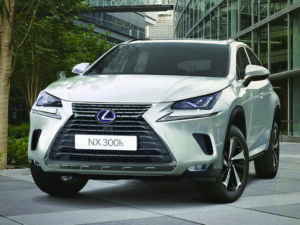 In the three years since it launched in the UK, the NX has already become Lexus’ biggest-selling model, taking around a third of the brand’s overall volume. Signs that a premium compact SUV with a hybrid powertrain to help offset the innate environmental unfriendliness of a faux-by-four has struck a chord with buyers. But, with plenty of fresh competition, it’s reached its time for an update to maintain that appeal. It’s mostly a cosmetic upgrade, with styling cues to bring the design of the NX more in line with the rest of the Lexus model line-up. Most obvious is the new nose, incorporating the latest iteration of the company’s spindle grille – which, depending on your view, is either bold or eye-searingly oversized – along with new bumpers and headlights. There are also new rear lights (designed to create the impression of a wider stance), including sequential indicators and a revised bumper. In the cabin, the display for the multimedia/infotainment system has been increased in size to 10.3 inches, which is a welcome change, while the remote interface touchpad has also been improved: that’s also welcome, but a software upgrade to make it more accurate and more reactive would have been even better. This system might be fine once you get used to it, but it feels clunky compared to BMW’s iDrive or Audi’s MMi – and all these systems are now arguably outdated in the face of the proliferation of touchscreens. The other significant change is the inclusion of the Lexus Safety System +, which includes AEB (called Pre-Collision System), adaptive cruise control, lane keeping assist, adaptive high beam and road sign assist – as standard-fit on all models. None of which radically changes the case for the NX, or the argument about whether a hybrid is better than a diesel.